The first Block 5 booster sits atop Launchpad 39A, adjacent to the SpaceX hangar. Space reporter Amy Thompson documented its May 11 and Aug. 7 launches. CAPE CANAVERAL, Fla. — Back in May, I stood near a massive blue countdown clock as the minutes and seconds ticked away to zero. I was surrounded by fellow space reporters, a small group of whom traveled to Florida all the way from Bangladesh. The excitement built and built — and then the launch scrubbed. The Falcon 9 just wasn't ready to fly that day. But the next day would be a different story. We all returned to our same viewing spot, adjacent to the countdown clock, and stared across the water at the sleek black-and-white Falcon 9 perched atop its launchpad, Pad 39A at Kennedy Space Center. This time, everything proceeded as expected: When the clock hit zero, smoke billowed and bright flames lit up the sky as the Falcon roared to life. The sound waves that washed over us several seconds later were noticeably louder than expected, even for this experienced launch-watcher. That's because this wasn't an ordinary Falcon, but a souped-up version. The company already reuses the first stages of its spacecraft, but this iteration will take that to the next level. Previous versions of the Falcon 9 could be used only two or three times, which is an incredible accomplishment, but not enough for SpaceX founder Elon Musk. His plan is to make rockets more like commercial airplanes, capable of flying many times with no action (other than refueling) taken in between flights. According to Musk, the Block 5, which is a culmination of more than 10 years of development, will do just that. The first Block 5 Falcon lifts off, carrying the Bangabhandu-1 satellite into space on May 11, 2018. To work toward that goal, SpaceX engineers outfitted this turbocharged Falcon with some sweet upgrades over its predecessors. The design changes — which include improved engines, a more durable interstage (the piece that connects the rocket's two stages), titanium grid fins and a new thermal protection system — will help the booster hold up better to launch stresses. According to SpaceX, each Block 5 can fly 10 times or more times before requiring light refurbishments, and as many as 100 times before the booster is retired. Musk has said that we will see a Block 5 launch, land and relaunch within the same day sometime next year. As the months tick away and the aerospace company focuses on its big task for the year, launching the first uncrewed test flight of the commercial crew program, that goal remains a lofty one. However, a more reasonable goal — one that SpaceX is close to achieving — is to see the same Block 5 booster launch more than two times in a year. The scorch marks indicate that this booster has already made the journey to space and back. 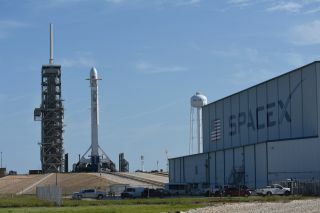 Following the first Block 5 launch on May 11, which placed Bangladesh's first satellite — the Bangabandhu-1 — in orbit, SpaceX officials said they didn't know when the recovered booster would fly again, as they would most likely take it apart and inspect it to make sure it performed as expected. So, it was a bit of a surprise when the company announced that the Bangabhandu-1 booster would fly again on Aug. 7, just 12 weeks later. That second launch, at Cape Canaveral's Pad 40, may have been more of a spectacle than the first. It's like with each launch the booster tries to outshine itself. Sitting in folding chairs on a causeway across the water from the launchpad, a group of space reporters waited. The Milky Way was barely visible overhead. One spectator even brought a telescope, and we peeked at Mars — which shined above like a glowing copper orb — before turning the scope to the launchpad. The Falcon appeared upside down in the viewfinder but stood ready to launch. We could see what looked like breath emanating from the rocket as the last of the cryogenic fuels that power the rocket were loaded. As the clock hit zero, the night sky lit up bright orange as the Falcon roared to life. Its engines were just as unexpectedly loud as they were the first time. But unlike its first trip to space, which was a bit more dramatic with several holds and a scrub, this flight went off right at the beginning of the window. As the Falcon climbed to space, the glow from its engines could be seen for several minutes. Surprisingly, after the booster separated from the upper stage and started its descent, far in the distance, we could see the Falcon's engines ignite for the first of its multiple planned landing burns. Cheers erupted over the loudspeaker as confirmation came in that the booster had touched down on the drone ship a second time. SpaceX's successful launch and landing of the Block 5 booster (on the company's East Coast-based drone ship "Of Course I Still Love You") with so little time in between is a huge step toward quicker re-flight times. In another surprising twist, and before the second landing was confirmed a success, the SpaceX launch webcast seemed to suggest that this booster would fly a third time before the end of the year. (Good thing it stuck its landing). Though which mission that booster will be used on hasn't been announced yet. The second flight of SpaceX's first Block 5 first-stage propels a Falcon 9 rocket into space on Aug. 7, 2018. A few days after its second flight, the booster stood proudly perched on the deck of the drone ship as it made its way back to port. I stood with a crowd of rocket enthusiasts on the docks, welcoming B1046 (a designation given by SpaceX to identify the booster), some of the space buffs tracking the ship it rode in on to ensure they would get the first glimpse as it peeked over the horizon. The booster arrived in port just a few days after launching. Crowds of people awaited its arrival, hoping to get the first glimpse of this veteran spacecraft. As the booster got closer to the drone ship's normal parking spot in the port, cameras snapped furiously, and the crowds increased. A storm rolled in, providing a nice backdrop of dark clouds and lightning. The booster looked much like it did on the launchpad, scorched and covered in soot from its first trip through the atmosphere. It was difficult to discern evidence of new wear and tear from this second trip to space. One thing was clear, B1046 looked ready for the next flight — suggesting SpaceX was on its way toward flying rockets on a par with commercial airliners. Will we see the Block 5's next major test — to launch, land and re-fly in a single day — this year? With SpaceX's commercial crew missions on the books as well as another resupply mission before the end of the year, and Falcon Heavy's second flight on the way, the company may have its hands full. But whenever it happens, it will be quite an accomplishment. Crews work to prep the booster for removal from the drone ship. Tiny humans help to provide a sense of scale for the massive booster.